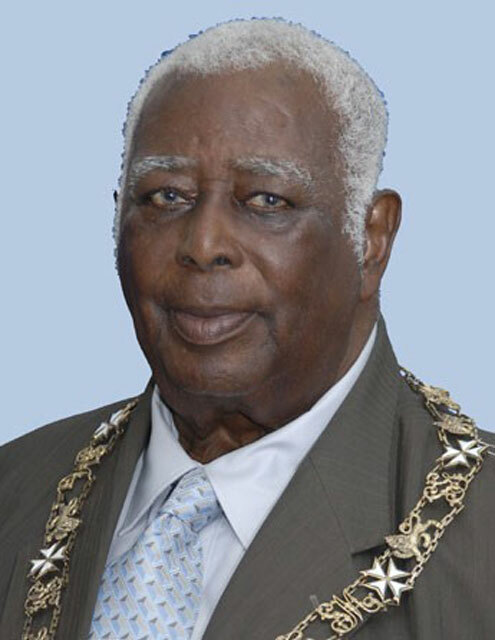 Basseterre, St. Kitts-Three men in St. Kitts and Nevis who have served as Prime Minister have paid tribute to former Governor General Sir Cuthbert Sebastian who passed away Saturday evening at his home on Cayon Street, Basseterre. Mr. Sebastian was 95 years old. He served as the second Governor General of St. Kitts and Nevis from 1995- 2013 and was the son of Joseph Mathew Sebastian, a pioneer of the Labour movement in St. Kitts and Nevis. Current Prime Minister of St. Kitts and Nevis Dr. Timothy Harris extended condolences to Sebastian’s family on behalf of the Government and people of the Federation. “May you find comfort and peace in the fond remembrances that many people both at home and abroad have of him, from his stellar service in the St. Kitts-Nevis Defence Force as its longstanding captain surgeon, in the H.M. Royal Air Force as a rear gunner during World War II, and as a captain in the Scottish Army during the 1960s, as well as in myriad capacities within the Federation’s healthcare sector,” said Dr. Harris. He described Sebastian as a “renaissance man” due to the varying capacities in which he served during his lifetime. “We have lost a treasure, but how blessed we are to have had him. Tonight, the many mothers and fathers whose babies he delivered are thinking of him. Sir Cuthbert Sebastian’s body is gone, but his legacy lives on in countless ways,” he declared. Former Prime Minister Dr. Denzel Douglas who was in office when Sebastian was appointed Governor General, speaking on public radio hailed Sebastian as “a giant of a man” and a personal friend. “I had the opportunity during his tenure as governor to visit him almost every dayTuesday, where I would report to him on Tuesday mornings of the proceedings of the cabinet the Monday before.,” he said. Dr. Douglas added that during those discussions they had dialogues on many subjects. “He was one who advised me on investment, how best to ensure that after hard work and earning that you would be able to save and leave something for your family,” he said. First Prime Minister St. Kitts and Nevis and National Hero Sir Kennedy Simmonds remembered Sebastian’s work in the medical fraternity. “As a schoolboy, I first knew him from a distance as a dispenser in the pharmacy at the Cunningham Hospital. Many years later we served together in our respective specialties at the Joseph N France General Hospital,” he said remembering the time they spent working together. “During our many hours in the operating theater, I came to respect him as a committed practitioner of the art and science of medicine. He saved many lives, gave many persons an opportunity to enjoy a better quality of life and brought new life into the world. At all times he demanded from his staff discipline, a commitment to excellence and a caring attitude in the delivery of patient care. March has been a dark month for St. Kitts and Nevis with the loss of two former Heads of State in Sir Probyn Inniss who was laid to rest last week and now with the passing of Sir Cuthbert Sebastian.